One-number semi-tables depend on having a vivid number that apparently is loaded with meaning, as in the well-known Harper's Index http://harpers.org/harpers-index/listing.php3 The method provides a way to get a lot of quantitative data into journalism. It is also a way to provoke thought and to indicate the diversity of possibly relevant evidence. These sorts of displays should almost always provoke the question "Isn't it more complicated than that?" In their news report along with the above graphic, The Times helpfully published a big supertable about graduation rates for various sports and various college divisions, indicating the dismal graduation rates especially for men's basketball (and the link between sports success and low graduation rates in those sports). Such displays should always be accompanied by the source of the data, so we can find out how much more complicated it is. Harper's provides the sources on a separate page in the magazine. These tiny facts also, now and then, have an urban legend quality. One way to have some estimation fun is to cover up the numbers and make a guess. 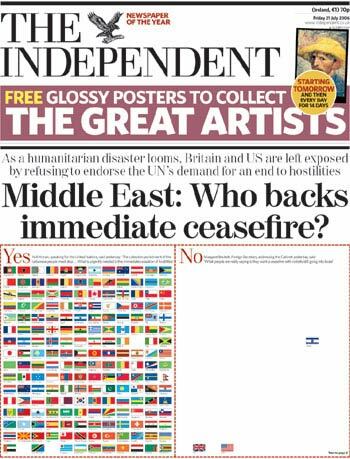 Dear Edward, I thought you (and the other users of the forum) might be interested in The Independent's front page graphic, which depicts the voting in a UN resolution to demand a ceasefire in the current Middle East conflict. How much is $87 billion for Iraq? Update: How about $1.2 trillion? Image sequence of ski crash: best design? Artful Sentences: Syntax as Style by Virginia Tufte now published!